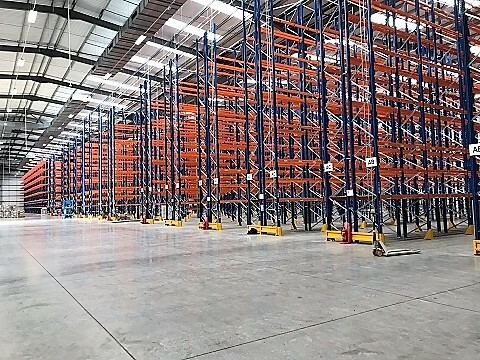 At warehouse storage solutions we are one of the UK’s leading suppliers of pallet racking solutions to customers in the Blackburn, Accrington & Colne valley region. We have a specialist team of technical sales experts on hand who will be happy to call and discuss how our wide range of pallet racking solutions can help you improve your storage and distribution efficiency. After all it is often much more cost effective to maximise your current space than having to run up costs in moving premises. We will always give best advice to customers and seek to get the most cost effective solution possible to meet your budget requirements. We supply to a wide range of clients from small and medium sized businesses looking to get more from their current premises through to Multi National corporations kitting out state of the art distribution facilities of 1,000,000 cubic feet and more. We are proud of the fact that the vast majority of the work we get comes through referrals from existing customers, and that in most cases we retain customers for the long term with them coming back time and again. We offer a wide range of specialist pallet racking solutions from our Yorkshire base suitable for all differing pallet racking types needed by businesses these days. This is the most popular type of pallet racking and is highly versatile as shelving can be varied according to whatever height you need. It usually has wide aisles offering superb easy access to pallets, simplicity and versatility are the keywords. The system enables pallets to be loaded onto rails where when you load a pallet it pushes the previous one back to make space, it can operate up to 6 pallets deep ! Essentially this is where the depth is twice the standard enabling maximum storage capacity with two rows back to back. As you need less aisle space then this really maximises the space. You will need fork lift trucks with telescopic forks but most find the investment really pays off. Where stock rotation is at a premium Live Pallet Racking are perfect, rollers inclined allow gravity to move pallets from the unloaded position through in a seamless transition through to the loading position. This style of racking enables customers to maximise the number of pallets in any given space allowing high density storage and if used in conjunction with specialist handling equipment a really cost effective option. With drive in pallet racking the system enables fork lift trucks to enter the actual storage lane maximising both the floor space and the building height. Designed for the British weather the galvanised system is more than happy to withstand everything the UK can throw at it !! If you have any ideas in mind or simply want to have a free survey and a discussion on that options will really be the best for your business then call Warehouse Storage Solutions today for an informal chat, or fill out the enquiry form online and one of our storage specialists will get back to you quickly. Call us today on 01423 819 057.